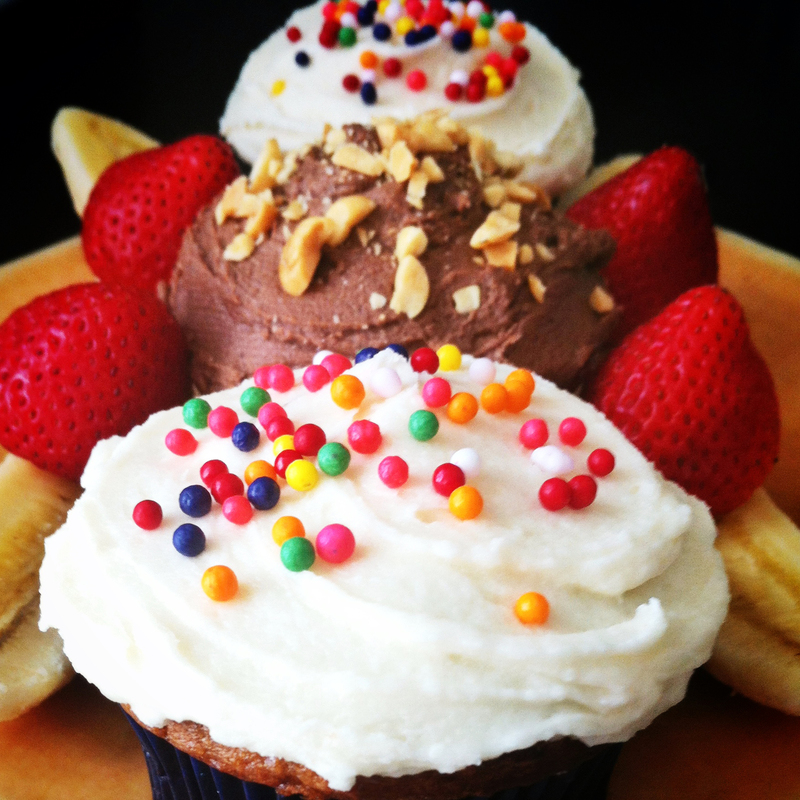 banana split cupcakes | omfg. so good. My parents own an ice cream shop in north central Pennsylvania, so I’ve spent many a sweaty summer afternoon scooping and topping (and eating) my fair share of ice cream. You might say I’ve become somewhat of an ice cream snob over the years. I also have uncommonly large forearm muscles. Now I’m all grown up and don’t ever have to “scoop” ice cream again. I just eat it straight out of the container with a mouth sized spoon. Much easier on the ol’ forearms. But, every now and then I get a hankering for the familiar flavor combination of chocolate, vanilla, strawberry, banana and peanuts that IS the banana split. And when mommy gets a hankering, y’all better watch out. Preheat oven to 350 degrees. Line a sheet pan with parchment paper. 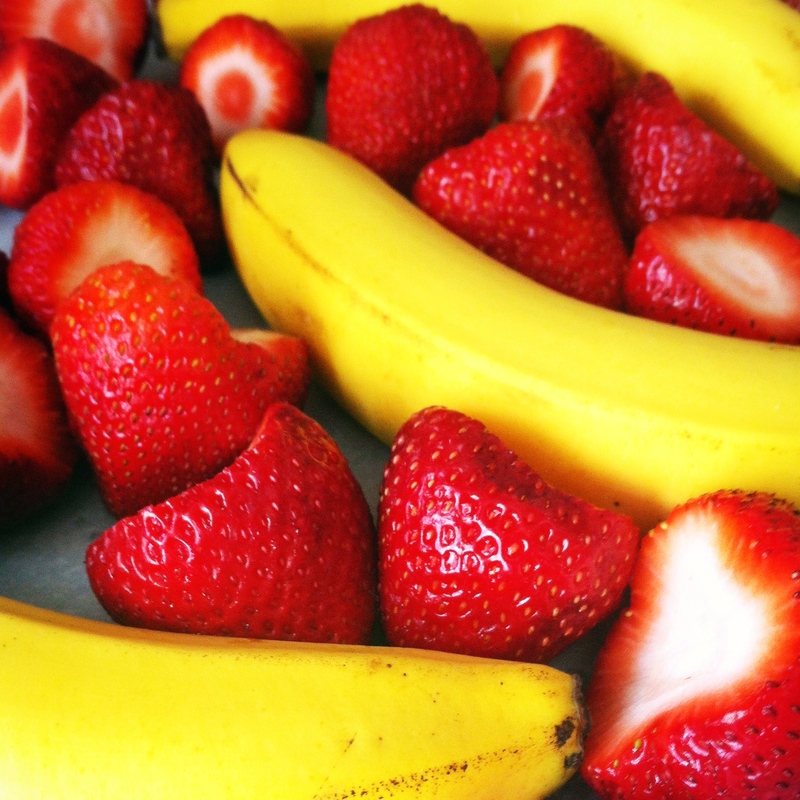 Rinse and hull the strawberries then arrange on the prepared sheet pan with the bananas. Roast in the preheated oven for 20 – 25 minutes. The bananas will turn dark brown/black and the strawberries will darken and shrivel. Attractive, right? Not really, but they sure do smell yummy. Peel the roasted bananas and toss everything into the blender. Puree to desired consistency. On to round two. 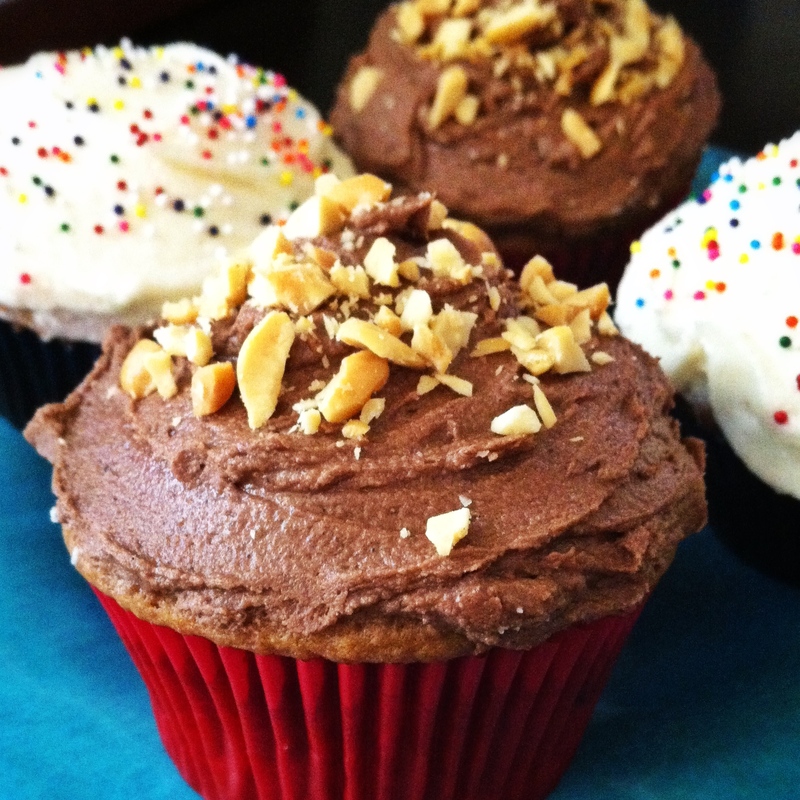 The cupcakes. These are actually made using a banana bread recipe that’s been adapted from one I stumbled across on thepioneerwoman.com. It’s seriously the best banana bread recipe in the universe. And it makes some pretty f’ing good cupcakes too. Preheat oven to 350 degrees. Line cupcake tins with papers. In a large mixing bowl, combine the butter and cream cheese, mix until smooth. Add in the brown sugar and mix until fluffy. Add in the strawberry banana pureé, egg and sour cream and mix until combined. Bake in preheated oven for 20 – 25 minutes or until toothpick inserted in center comes out clean. After the smell of these badboys permeated the kitchen, and woke Chonker up from his afternoon nap, I decided nothing short of both chocolate and vanilla buttercream would do. Cream butter in a medium sized mixing bowl on medium speed. In a separate bowl, sift together powdered sugar, cocoa powder and salt. Slowly add the powdered sugar mixture to the creamed butter and continue to mix on medium speed until smooth. Add heavy cream and mix to combine until smooth and creamy. Cream butter in a medium sized mixing bowl on medium speed. Slowly sift in the powdered sugar and salt. Continue mixing, add in vanilla and heavy cream and mix until smooth and creamy. 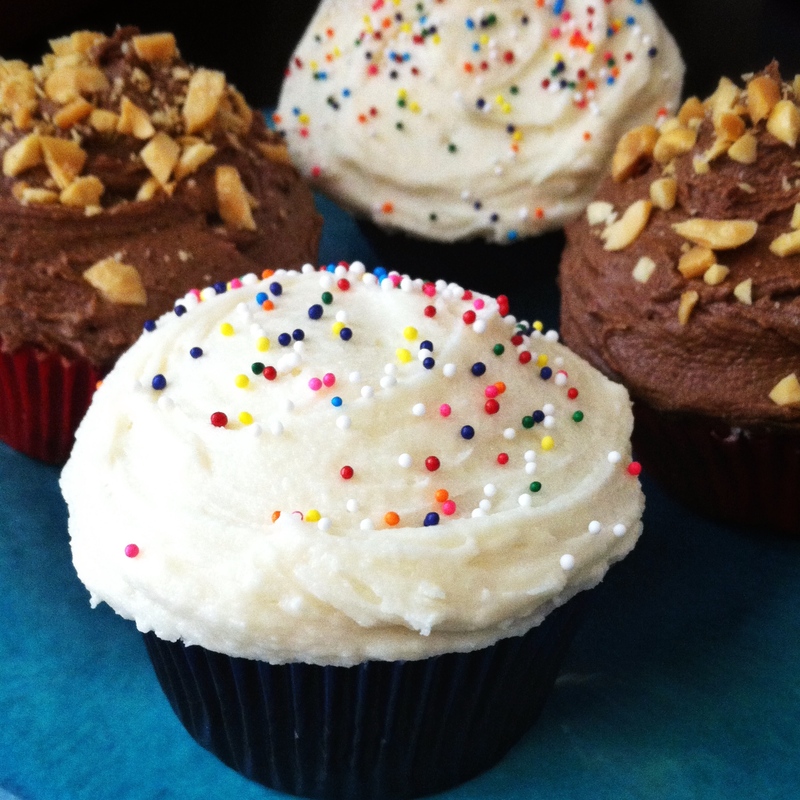 Peanuts and sprinkles optional, but highly recommended.